In doing some testing with Oracle GoldenGate Studio, I decided to create a test solution that can be moved from studio-to-studio. In order to move the test solution from studio-to-studio, it has to be exported first. This post will be about how to export a solution so it can be archived or shipped to a co-worker. To export a solution, you will start in the Projects window. After opening the project, you will see a little red puzzle piece under the “Solutions”. 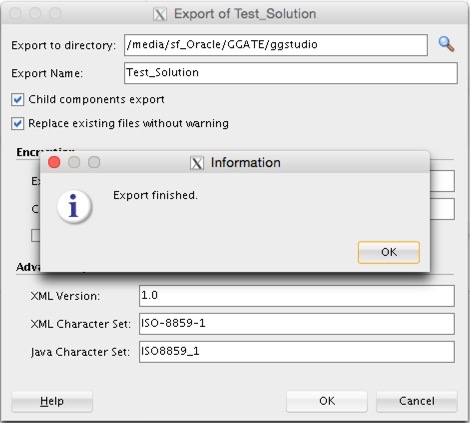 By right-clicking on the solution name, you are presented with a context menu that provides a few options for dealing with solutions within Oracle GoldenGate Studio. The option you are interested in, is at the very bottom of the context menu. This is the export option. After selecting the “export” option, studio will open a small wizard that allows you to provide information and options for the solution that is to be exported. Everything on the export screen can be edited; however, the only thing that should not be changed is the “Advanced Options”. Provide a directory where the export should reside and provide an encryption key (optional). When everything is filled out as you want, click “ok” and the export will be done. At the end of the export, should be pretty quick, you will receive a message saying that the export completed. Once the export is completed, you will find the XML file in the directory you specified in the export wizard. This XML file can be opened up with any text editor and reviewed. A sample of the XML content is provided below. The beauty in this XML file is that everything created in studio is contained within it. This makes it every simple and easy to email to co-workers or others if they want to see the architecture being worked on. Making collaboration on GoldenGate architectures easier. Perfect tool, but this not yet released, isn’t it ? Correct, not released yet. Stay tuned though.